WHY WORRY ABOUT LOW VITAMIN D LEVELS? The normal range is 30.0 to 74.0 nanograms per milliliter (ng/mL). 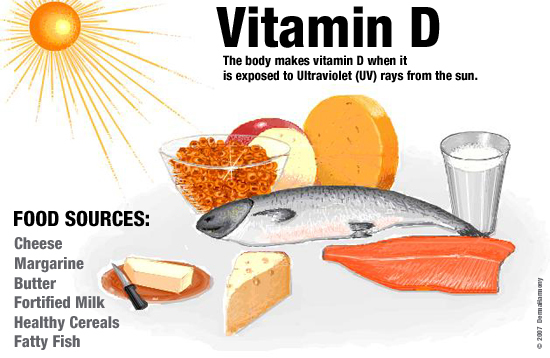 Vitamin D appears to have effects on immune function. It has been postulated to play a role in influenza with lack of vitamin D synthesis during the winter as one explanation for high rates of influenza infection during the winter. For viral infections, other implicated factors include low relative humidities produced by indoor heating and cold temperatures that favor virus spread. Low levels of vitamin D appear to be a risk factor for tuberculosis, and historically it was used as a treatment. As of 2011, it is being investigated in controlled clinical trials. Vitamin D may also play a role in HIV. Although there are tentative data linking low levels of vitamin D to asthma, there is inconclusive evidence to support a beneficial effect from supplementation. Accordingly, supplementation is not currently recommended for treatment or prevention of asthma. Also, preliminary data is inconclusive for supplemental vitamin D in promotion of human hair growth. In 2012, the U.S. Preventive Services Task Force issued a draft statement recommending that there is not enough evidence to indicate that healthy postmenopausal women should use supplemental doses of calcium or vitamin D to prevent fractures. Some studies have shown that supplementation with vitamin D and calcium may improve bone mineral density slightly, as well as decreasing the risk of falls and fractures in certain groups of people, specifically those older than 65 years. This appears to apply more to people in institutions than those living independently. The quality of the evidence is, however, poor. And there does not appear to be a benefit to bone health from vitamin D without sufficient calcium. Low levels of vitamin D are associated with multiple sclerosis. Supplementation with vitamin D may have a protective effect but there are uncertainties and unanswered questions. “The reasons why vitamin D deficiency is thought to be a risk factor for MS are as follows: (1) MS frequency increases with increasing latitude, which is strongly inversely correlated with duration and intensity of UVB from sunlight and vitamin D concentrations; (2) prevalence of MS is lower than expected at high latitudes in populations with high consumption of vitamin-D-rich fatty fish; and (3) MS risk seems to decrease with migration from high to low latitudes.” A clinical trial sponsored by ChariteUniversity in Berlin, Germany was begun in 2011, with the goal of examining the efficacy, safety and tolerability of vitamin D3 in the treatment of Multiple Sclerosis. So, get your levels checked today. It is a simple test. Call your healthcare provider to get the test ordered. It will save you from a bad future of your health !!! Current Healthcare situation is changing. Performance is awarded, not value. One of the biggest issues in healthcare management is the cost of medical care services and insurance. Health insurance rates often increase faster than inflation, which means they consume a larger portion of an employer’s money or an individual buyer’s income. Some employers cut their health benefits to employees as costs rise or during a period of financial distress, forcing more people to pay for their own healthcare. Those who can’t afford to do so add to the number of uninsured Americans or receive benefits from a government-subsidized program such as Medicare or Medicaid. Litigation is a significant issue for medical practices and healthcare providers alike. The threat of malpractice suits forces doctors to spend a great deal on malpractice insurance, and practitioners must pass some of this cost on to patients. Legal disputes between patients, insurance providers and healthcare providers take time and money away from medical research and treating patients. Access to affordable, high-quality healthcare is far from a given for millions of people. Programs such as Medicare and Medicaid are only available to elderly and low-income individuals and families that qualify. Group insurance is only an option for members of groups that receive reduced rates, such as employees of a company or members of a social club. Staffing is an ongoing issue in hospitals, doctors’ offices, nursing homes and other facilities that needs trained specialists on hand to assist patients. The broad shortage of nurses means that many duties fall to untrained or inexperienced assistants, thereby driving up the likelihood of error. Discrepancies in pay draw medical students away from certain fields and into others, resulting in a lopsided distribution of doctors and a lack, or surplus, of options for patients. Healthcare management seeks to offer different types of care to patients. 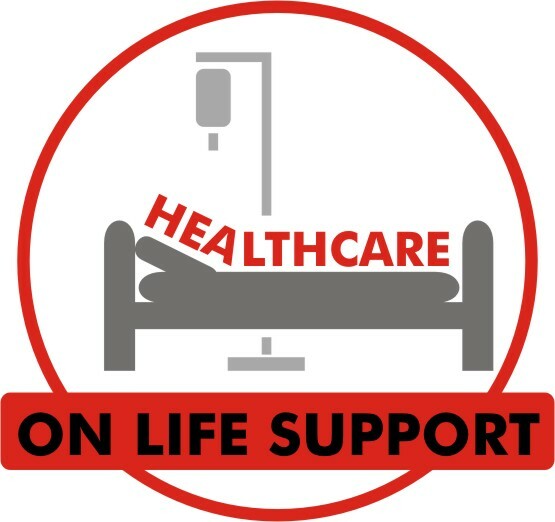 For example, terminally ill patients may elect to receive end-of-life palliative care, which focuses on alleviating symptoms instead of aggressively combating disease. Preventative care takes place before symptoms appear and saves time and money in the long-term, but requires an early awareness and up-front spending by insurance providers or patients. Electing between different types of care requires healthcare providers to educate patients and also demands that individuals take control of their own healthcare needs. Do we have the Right Models? Health care is the country’s economic black hole, rising from about 13% of U.S. GDP in 1999 to 18% in 2009. By 2025, it is projected to soar to 25%. Legislation and regulation can only go so far in fixing the system, and new technology can’t do much on its own. To truly combat health care’s cost challenge, the focus must shift to disruptive business models–innovative ways of delivering existing treatments at a much lower cost. While new business models are needed across the spectrum of healthcare, many impediments prevent new ideas from taking root. Barriers stem from the fact that health care in America doesn’t function like the free market. For instance, consumers rarely pay directly for their own care, so there is little incentive for making trade-offs such as choosing something cheaper that costs less. The regulatory environment often doesn’t allow inexpensive solutions to make it to market. Finally, there are mismatched incentives: hospitals want patients to get that operation, but insurance companies don’t. Health care in America doesn’t function like the free market. Given all that’s standing in the way of enabling new business models, we must take note when promising ones appear ready to take off. The lesson isn’t that healthcare companies should accept charging less and making lower profits. Instead, through business model innovation, companies need to examine their value chains and throw away assumptions about the way things are done. By reinventing business models we can dramatically reduce costs and greatly improve care. Q: How can changes be made? 3. Develop workable business and IT infrastructure models. 4. Extending the patient-physician interaction beyond the office visit using telemedicine tools, as well as using health information exchange (HIE) to aggregate data from multiple sources. 6. Applying Lean and Six sigma to current Management and workforce. 7. TELE-HEALTH: Being able to communicate using IT tools to help patients stay healthy and get rewarded well. 8. Transparency: Everyone should know what is happening in the organization. There are various approaches to eating disorders treatment. It is important to find an option that is most effective for your needs. Once you have chosen a treatment provider, you may want to consider asking these questions in your first meeting. Eating disorders can lead to significant physiological changes that require medical treatment in addition to psychiatric treatment and the reimbursement system does not allow for a holistic approach. For this reason, patients and families frequently have to fight to get the appropriate and necessary treatment. Unfortunately, some patients and families frequently have to fight to get the appropriate and necessary treatment for eating disorders. Here are some arguments to use when trying to secure treatment from an insurance provider or another third party. Research suggests that nearly 50% of individuals with an eating disorder (ED) are also abusing drugs and/or alcohol, a rate 5 times greater than what is seen in the general population according to the National Center on Addiction and Substance Abuse. A complete medical assessment is important when diagnosing eating disorders. Talk with your doctor about performing specific laboratory tests. When you begin to notice that disordered eating habits are affecting your life, your happiness, and your ability to concentrate, it is important that you talk to somebody about what you’re going through. The most effective and long-lasting treatment for an eating disorder is some form of psychotherapy or counseling, coupled with careful attention to medical and nutritional needs. Ideally, this treatment should be tailored to the individual and will vary according to both the severity of the disorder and the patient’s individual problems, needs, and strengths. The Holidays can be a time to spend with loved ones and a time to celebrate. They can also be a time when food and family can provoke anxiety and present triggers. This guide suggests a few ideas that may help you plan ahead and get your supports in place. Weight-loss medications should always be combined with a program of healthy eating and regular physical activity. 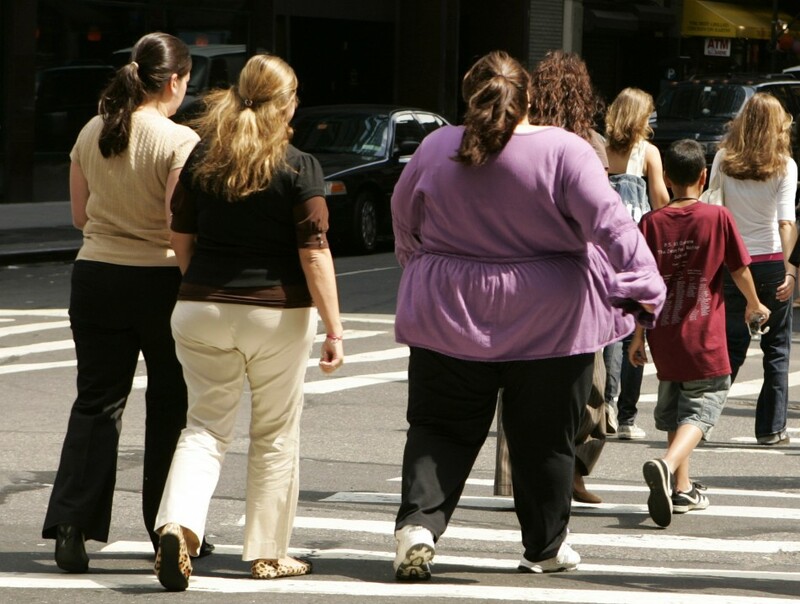 Obesity is a chronic disease that affects many people. To lose weight and maintain weight loss over the long term, it is necessary to modify one’s diet and engage in regular physical activity. Some people, however, may require additional treatment. As with other chronic conditions, such as diabetes or high blood pressure, the use of prescription medications may be appropriate for some people who are overweight or obese. Prescription weight-loss medications should be used only by patients who are at increased medical risk because of their weight. They should not be used for “cosmetic” weight loss. 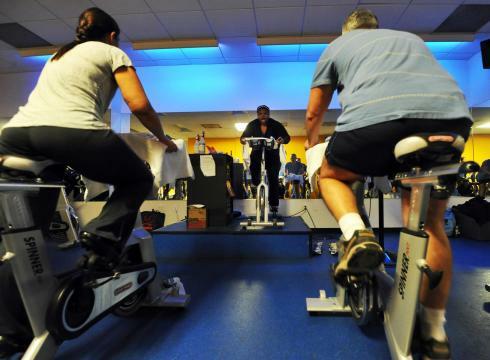 In addition, patients should have previously tried to lose weight through diet and physical activity. A body mass index (BMI) of 30 and above. A BMI of 27 and above with an obesity-related condition, such as high blood pressure, type 2 diabetes, or dyslipidemia (abnormal amounts of fat in the blood). Although most side effects of prescription medications for obesity are mild, serious complications have been reported. Also, few studies have evaluated the long-term safety or effectiveness of weight-loss medications. Weight-loss medications should always be combined with a program of healthy eating and regular physical activity. The information in this fact sheet may help you decide if and what kind of weight-loss medication may help you in your efforts to reach and stay at a healthy weight. It does not replace medical advice from your doctor. Table 1 provides an overview of medications that may be prescribed for weight loss. Because weight-loss medications are used to treat a condition that affects millions of people, the possibility that side effects may outweigh benefits is of great concern. Most of the Food and Drug Administration (FDA)-approved weight-loss medications are approved for short-term use, meaning a few weeks, but doctors may prescribe them for longer periods of time—a practice called “off-label” use. (See the below for more information about off-label use.) Orlistat is the only weight-loss medication approved for longer-term use in patients who are significantly obese. Its safety and effectiveness have not been established for use beyond 2 years, however. Appetite Suppressants. Most available weight-loss medications approved by the FDA are appetite-suppressant medications. These include phentermine, phendimetrazine, and diethylpropion. 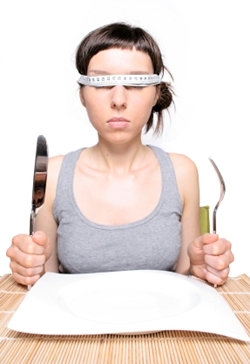 Appetite-suppressant medications promote weight loss by decreasing appetite or increasing the feeling of being full. These medications make you feel less hungry by increasing one or more brain chemicals that affect mood and appetite. Phentermine is the most commonly prescribed appetite-suppressant in the United States. NOTE: Amphetamines are a type of appetite suppressant. However, amphetamines are not recommended for use in the treatment of obesity due to their strong potential for abuse and dependence. Lipase Inhibitors. In 1999, the FDA approved the drug Xenical (orlistat) as a prescription weight loss drug. Orlistat reduces the body’s ability to absorb dietary fat by about one-third. It does this by blocking the enzyme lipase, which is responsible for breaking down dietary fat. When fat is not broken down, the body cannot absorb it, so it is eliminated and fewer calories are taken in. The following types of medication(s) are not FDA-approved for the treatment of obesity. However, they have been shown to promote short-term weight loss in clinical studies and may be prescribed off-label. Drugs to treat depression. Some antidepressant medications have been studied as appetite-suppressant medications. While these medications are FDA-approved for the treatment of depression, their use in weight loss is an off-label use . Studies of these medications have generally found that patients lose modest amounts of weight for up to 6 months, but that patients tend to regain weight while they are still on the drug. One exception is bupropion. In one study, patients taking bupropion maintained weight loss for up to 1 year. Drugs to treat seizures. Two medications used to treat seizures, topiramate and zonisamide, have been shown to cause weight loss. Whether these drugs will be useful in treating obesity is being studied. Drugs to treat diabetes. The diabetes medication metformin may promote small amounts of weight loss in people with obesity and type 2 diabetes. How this medication promotes weight loss is not clear, although research has shown reduced hunger and food intake in people taking the drug. Drug combinations. The combined drug treatment using fenfluramine and phentermine (known as “fen/phen”) is no longer available due to the withdrawal of fenfluramine from the market after some patients experienced serious heart and lung disorders. (See the “Potential Risks and Concerns” section.) Little information is available about the safety or effectiveness of other drug combinations for weight loss, including fluoxetine/phentermine, phendimetrazine/phentermine, herbal combinations, or others. Until more information on their safety or effectiveness is available, using combinations of medications for weight loss is not recommended, except as part of a research study. Although the FDA regulates how a medication can be advertised or promoted by the manufacturer, these regulations do not restrict a doctor’s ability to prescribe the medication for different conditions, in different doses, or for different lengths of time. The practice of prescribing medication for periods of time or for conditions not FDA-approved is known as off-label use. While such use often occurs in the treatment of many conditions, you should feel comfortable about asking your doctor if he or she is using a medication or combination of medications in a manner that is not approved by the FDA. The use of more than one weight-loss medication at a time (combined drug treatment) is an example of an off-label use. Using weight-loss medications other than orlistat for more than a short period of time (i.e., more than “a few weeks”) is also considered off-label use. People respond differently to weight-loss medications, and some people experience more weight loss than others. Weight-loss medications lead to an average weight loss of about 10 pounds more than what you might lose with nondrug obesity treatments. Maximum weight loss usually occurs within 6 months of starting the medicine. Weight then tends to level off or increase during the remainder of treatment. Over the short term, weight loss in individuals who are obese may reduce a number of health risks. Studies have found that weight loss with some medications improves blood pressure, blood cholesterol, triglycerides (fats), and insulin resistance (the body’s inability to use blood sugar). New research suggests that long-term use of weight-loss drugs may help individuals keep off the weight they have lost. However, more studies are needed to determine the long-term effects of weight-loss drugs on weight and health. Research has yet to determine the long-term health effects of weight-loss drugs. To date, the longest study is a 4-year investigation of orlistat. Most other studies have lasted 6 to 12 months or less. In addition, research has not examined rare side effects (those occurring in less than 1 per 1,000 patients), and the optimal duration of treatment is unknown. When considering long-term weight-loss drugs to treat obesity, you should consider the following areas of concern and potential risks. Potential for abuse or dependence. Currently, all prescription medications to treat obesity except orlistat are controlled substances, meaning doctors need to follow certain restrictions when prescribing them. Although abuse and dependence are not common with nonamphetamine appetite-suppressant medications, doctors should be cautious when they prescribe these medications for patients with a history of alcohol or other drug abuse. Development of tolerance and weight regain. Most studies of weight-loss drugs show that a patient’s weight tends to level off after 6 months while still on the drug. Although some patients and doctors may be concerned that this shows tolerance to the medications, the leveling off may mean that the maximum amount of weight loss that the drug can produce has been achieved. Studies examining the effects of weight loss drugs showed that after one year, patients receiving a weight loss drug lost more weight than patients in the placebo group. Findings also indicated that patients who continued treatment regained less weight compared with those who stopped treatment. Reluctance to make behavioral changes while using prescription medications. Patients who are overweight or obese should be able to seek medical treatment to prevent health risks that can cause serious illness and death. Weight-loss drugs, however, are not “magic bullets” or a one-shot fix for this chronic disease. They should always be combined with a healthy eating plan and increased physical activity. Side effects. Because weight-loss drugs are used to treat a condition that affects millions of people, many of whom are basically healthy, the possibility that side effects may outweigh benefits is of great concern. Most side effects of these drugs are mild and usually improve with continued use. Rarely, serious and even fatal outcomes have been reported. 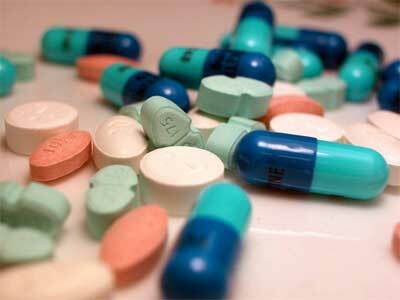 Some of the common side effects of the drugs are explained in this section. Other appetite suppressants. Phentermine, phendimetrazine, and diethylpropion may cause symptoms of sleeplessness, nervousness, and euphoria (feeling of well-being). People with heart disease, high blood pressure, an overactive thyroid gland, or glaucoma should not use these drugs. Two appetite-suppressant medications, fenfluramine and dexfenfluramine, were withdrawn from the market in 1997. These drugs, used alone and in combination with phentermine (fen/phen), were linked to the development of valvular heart disease and primary pulmonary hypertension (PPH), a rare but potentially fatal disorder that affects the blood vessels in the lungs. There have been only a few case reports of PPH in patients taking phentermine alone, but the possibility that phentermine use is associated with PPH cannot be ruled out. NOTE: In 2010, the FDA asked Abbott Laboratories to voluntarily remove Meridia (sibutramine) from the U.S. market. Abbott Laboratories agreed to remove the drug from the market. Sibutramine is a weight-loss drug that works to reduce one’s appetite. Data from clinical trials showed an increased risk of heart attacks and strokes among patients using the drug. More information about sibutramine is available athttp://www.fda.gov. Q: Can drugs replace physical activity or changes in eating habits as a way to lose weight? A: No. Studies show that weight-loss medications work best when combined with a weight-control program that helps you improve your eating and physical activity habits. Ask your doctor about ways you can improve your eating plan and become more physically active. Q: How do I decide which drug is right for me? A: Choosing a weight-loss drug is a decision between you and your health care provider. You will consider the drug’s side effects, your family’s medical history, and your current medical conditions and medicines. Q: What medical history, conditions, or medications might influence my decision to take a weight-loss drug? History of depression or manic depressive disorder. Heart disease or heart condition, such as an irregular heart beat. Use of monoamine oxidase (or “MAO”) inhibitors or antidepressant medications. Plan to have surgery that requires general anesthesia. Q: How long will I need to take weight-loss medications to treat obesity? A: The answer depends upon whether the medication helps you to lose and maintain weight and whether you have any side effects. Because obesity is a chronic disease, nondrug treatment including diet changes and regular physical activity may need to be continued for years, and perhaps a lifetime, to improve health and maintain a healthy weight. However, like many other types of drugs, there is still little information on how safe and effective weight-loss medications are for many years of use. At least one study has shown that intermittent use (1 month on medication and 1 month off medication) may help some people lose and maintain weight, but more research is needed. Q: Will I regain some weight after I stop taking weight-loss medications? A: Probably. Most studies show that the majority of patients who stop taking weight-loss medications regain the weight they lost. Maintaining healthy eating and physical activity habits may help you regain less weight or keep it off. Q: Can children or teens use weight-loss medications? A: Prescription orlistat is currently approved for use in teens age 12 or above. Other weight-loss drugs are not approved for use in children under age 16, although studies in children and teens are ongoing. Metformin is a drug being studied in clinical trials. Early reports show it to be safe and effective, but more research is needed and it has not been FDA-approved for children or adolescents. Q: Will insurance cover the cost of weight-loss medication? A: Currently, many insurance companies will not pay for weight-loss drugs, but this is changing as insurers begin to recognize obesity as a chronic disease. Contact your insurance company to find out if prescription weight-loss medication is covered under your plan. A 1-month prescription can cost from 60 dollars to more than twice this amount. Ask a staff member at your pharmacy what a 1-month supply of the medication you are considering taking will cost. Most patients should not expect to reach an “ideal” body weight using currently available medications. However, even a modest weight loss of 5 to 10 percent of your starting body weight can improve your health. Together, you and your doctor can make an informed choice as to whether medication can be a useful part of your weight-control program. Chronic GERD that is untreated can cause serious complications. Inflammation of the esophagus from refluxed stomach acid can damage the lining and cause bleeding or ulcers—also called esophagitis. Scars from tissue damage can lead to strictures— narrowing of the esophagus—that make swallowing difficult. Some people develop Barrett’s esophagus, in which cells in the esophageal lining take on an abnormal shape and color. Over time, the cells can lead to esophageal cancer, which is often fatal. 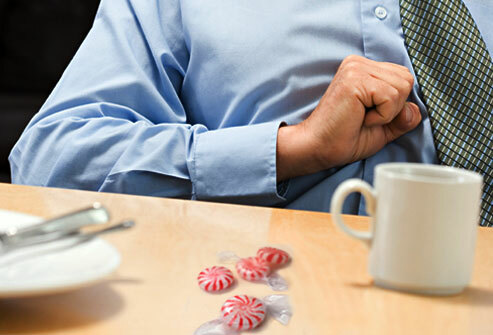 Persons with GERD and its compli­cations should be monitored closely by a physician. • Barium swallow radiograph uses x rays to help spot abnormalities such as a hiatal hernia and other structural or anatomical problems of the esopha­gus. With this test, you drink a solu­tion and then x rays are taken. The test will not detect mild irritation, although strictures—narrowing of the esophagus—and ulcers can be observed. passed through the endoscope and allow the doctor to remove small pieces of tissue from your esophagus. lems if infection or abnormal growths are not found. toms, including wheezing and cough­ing, are triggered by reflux. a reasonable alternative to a lifetime of drugs and discomfort.